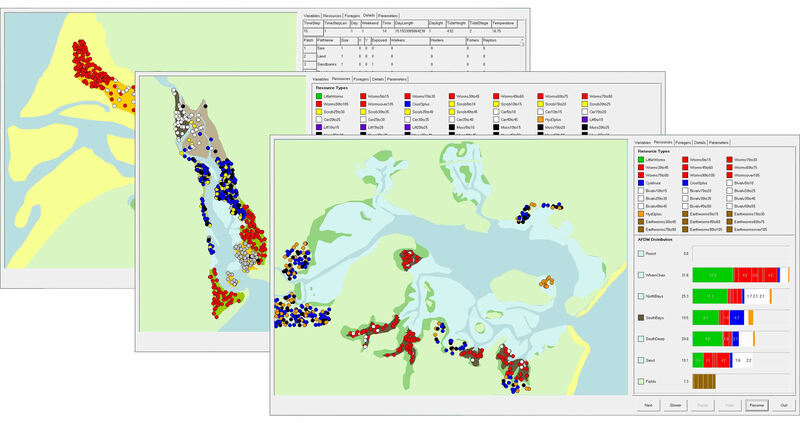 WaderMORPH makes it easier for conservation managers and other interested parties to apply these models to new sites and management scenarios. Shorebird models can be created and modified, simulations run and results presented within the WaderMORPH interface. The purpose of WaderMORPH is to provide an interface which allows end-users to create and edit MORPH’s simulation files without having to deal with their complexity. It packages all the complexity of MORPH’s parameters into a series of modules which can be included in the model simply by selecting options on a series of onscreen forms. Technical and mathematical details of parameterisation are shielded from the user. The end user is then only required to enter details specific to their particular situation, such as the species of bird present and their numbers, the types of prey present and their abundance. WaderMORPH runs the MORPH model using the generated parameter file, and presents the user with a summary of the predictions. In this way, the predictive capability of the MORPH model for shorebird populations can be made available for use by a wider range of organisations. WaderMORPH was developed as a collaborative project between the authors of this article. WaderMORPH was developed using CodeGear Delphi 2007 (http://www.codegear.com) taking into account the requirements of and testing by the remaining project partners. WaderMORPH comes with all the data needed to set up a sample model. WaderMORPH is a free software package. Morph Software please provide your name and email address.